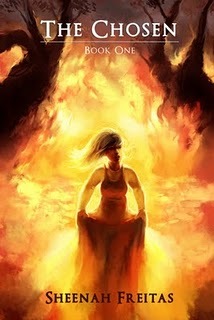 Kaia's entire life has erupted in flames after an assassin appears and burns her village down. She's rescued by a god from another planet who requests her help because she's the descendant of their last savior. Together with Reeze -- the only other survivor from her village and her appointed guardian -- they set off on a quest to find the treasures of the gods in hopes of preventing a dire prophesy. Kaia and Reeze quickly meet the Tueors, a group of people many thought extinct, who are searching specifically for Kaia. Their intention: to protect the truth. As Kaia discovers more about the truth and her family's past, she also learns of the Tueors' bloody secret. Will Kaia be the savior the gods have been waiting for? Or will she let the prophesy come true? I read an unedited ARC, so this might change by the time that it is published. There were several words that were used in the wrong context and other times, the phrasing just seemed wrong or made little sense. The world building could have been more believable. I just didn't see why it was based on a sister planet of Earth. It just didn't seem realistic or likely. I think that with more editing, this book could be very exciting. The characters each had distinct and unique personalities that I enjoyed. The plot was rather exciting too. After the kinks are fixed, I would recommend this book to fans of Fantasy.